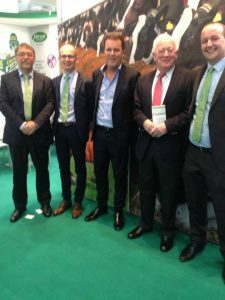 Mervue Laboratories attending EuroTier 2018 Hanover, Germany. The Mervue Laboratories team were delighted to have Anne Lanigan, Enterprise Ireland- Eurozone Director, H.E Michael Collins, Ambassador of Ireland to Germany and Minister Pat Breen, Minister of State with special responsibility for Trade, Employment, Business, EU Digital Single Market and Data Protection at the stand this year photographed here with Commercial Director-William Twomey. This year at Eurotier 2018 it was Fantastic to have retired founder Denis Twomey at the stand at EuroTier, pictured here with his son and Commercial Director William Twomey. 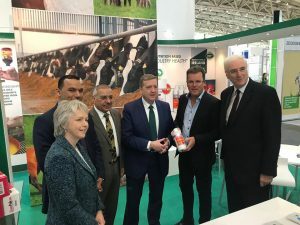 Also pictured Mervue Regional sales manager Radi Bogdanov, Veterinary support Dr. Dan Sinteoan and Nutritionist Sam Sweetnam.